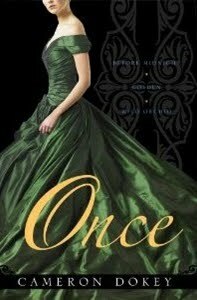 Perhaps one of the reasons I love fairy tale retellings so much is because I went through middle school and beginning of high school eagerly awaiting the release of the next book in the Once Upon a Time... series put out by Simon Pulse. They're short little retellings of some really excellent fairy tales, and while the latest ones haven't exactly been so great, the earlier books are quite lovely. They're written by a bunch of different authors, but Cameron Dokey is the most prolific writer of this series, and in my opinion, the best. Luckily for us Simon Pulse is releasing three of the retellings she wrote into one volume, called Once. It will be out February 7th, 2012, and it will have Before Midnight (one of the best books in the entire series and one of my favorite Cinderella retellings), Golden (a Rapunzel retelling! I love Rapunzel! ), and Wild Orchid (a retelling of Mulan, who is awesome). Plus, as you can no doubt seen, the cover is absolutely gorgeous! I want that dress so badly! So, even though it is a long wait, I recommend adding Once to your wishlist! It's $9.99 (or $8.99 for the digital edition), which is a steal considering you're getting three books in one! I can't wait for more readers to rediscover the lovely, magical writing of Cameron Dokey! How pretty! I love this series and Cameron Dokey is one of my favorite contributing authors. Too bad Beauty Sleep isn't included. They have such beautiful covers for this series. Love the dress! Reminds of the Luxe series covers! I read the Once Upon a Time series. Practically all of them. The best, for me, was probably The Crimson Thread, the retelling of Rumpelstiltskin. Oh! That's fantastic! I do love Cameron Dokey and I agree that her cinderella is one of the best! Thanks for the heads up with this one! I loved this series, too! There were definitely some stellar entries early on. I think my favorites were Snow by Tracy Lynn and Water Song by Suzanne Weyn. Speaking of fairy tales... have you read Snow White and Rose Red by Patricia Wrede or Briar Rose by Jane Yolen? Absolute classics in fairy tale re-tellings.